Friend Reeve is an excellent curator of culture, but he takes some counterintuitive views on critically acclaimed works of art. The much-beloved La La Land is a great example. Because he is so ornery about it, I have posted his rant. Elise: Since when did you become an expert on jazz? Reeve: I’m not. And neither is anyone involved with La La Land. In fairness, if you like colors, and you don’t care that much about story or character or acting or music, you might like La La Land just fine. Elise: I thought it was an excellent movie experience. Bittersweet at the end. Elise: It wasn’t deep. It didn’t need to be. Reeve: I didn’t say it needed to be deep. It would have been better if it had 1) good songs, 2) a good (enough) story, 3) a capable leading man. It was built on cliches and doesn’t make any sense. Elise: It’s ambition vs love. Tale as old as time. Reeve: This guy, who has been nothing but a jerk to Emma Stone, is more autistic than charming. Gets into a successful band, this band, by the way, plays the only listenable song in the entire movie. So he’s been touring with the band for a few months, making $1K/week plus a cut of merch, so more money than when he had a STAIN ON HIS CEILING, which apparently is a hardship. But he’s not rolling in dough. And she is mad that after a few month of this, he is not focusing all of his energy into opening a single jazz club. This is not drama. It is drama written by 18 year olds. It is idiotic. And that’s before your get to the fact that neither leading actor in the musical could sing particularly well. Maybe it will be to awful nails-on-the chalkboard whisper singing what O Brother Where Art Thou was to Americana music. Elise: My god. I had no idea you felt this way. Reeve: I also hated Manchester by the Sea if you want to change topics. I just saw La La Land yesterday, so it’s fresh. And I LOVE musicals. So it’s not like I’m anti-musical. I feel like the music in a musical should enhance the moments and emotions in what is a good story. It cannot replace or make up for a the key elements of a good story, performance, etc. Which is what they tried to do here. Even the minor points in the movie are stupid. Like — what is so incompatible about Samba and Tapas? One is a style of dance, the other is a format of serving food. It is not hard to do both. Why all the harping on this issue? Why didn’t an editor at some point say — maybe we should make this joke make more sense, like … samba and bbq. Or you know — anything. Or maybe just move on from the jazz-fetishizing white guy trope. Elise: Is the jazz-fetishing white guy trope a thing? Reeve: Yes. Did you read the Slate article I sent you? It has a delicious list of basically white guys mansplaining jazz to women in TV and film. Woody Allen does it a ton, though he actually does play jazz. So maybe that’s ok. The ritual when I return home. Transferring the pumped milk from the trip into storage bags so there’s a stock for next time. A pretty experienced traveler herself. Isabel, 11 months. Before I moved to Asia, my notion of freedom largely existed in the realm of figurative freedom, that is, to live in the moment and be free of worry about what was next, or what was buzzing on my smartphone. “How to live freely” was notional — a mental freedom, because the other kinds were a given. A year into this Asian life, my entire freedom construct has changed. The areas where freedom was default — the freedom to breathe without endangering my health, the freedom to browse the Internet without hitting walls, the freedom to speak and be understood, are no longer a given. I have come to know the challenge of not having a common language in which to communicate with sources, and in everyday life. Korea and Japan, my coverage areas, are famously homogenous societies. In Korea, the number of other “foreigners” living here is three percent. My Korean interpreter is excellent, but there is a certain captivity when speaking through someone else’s voice; something I never understood so clearly until living this way for the past year. Would I be able to get that one interview if I were expressing myself properly, or if there were a way to do nuance when speaking through a proxy? Is there an entire world that could be unlocked to us if we could understand what the hell was going on around us? It is my job to monitor North Korea, but North Korean sites are more accessible from the Chinese internet famous for its ‘Great Firewall’ than they are in Seoul, where South Korea blocks North Korean news and information sites under a Cold War-era national security law, a holdover from the time of fear that communist ideology would creep south of the border. Getting on trusted Western news sites in China, meanwhile, makes you long for the dial-up internet speeds of the early 1990s. VPNs can help, but only so long as the Chinese censors don’t kick you off of them just as you’re getting connected. But my main anxiety is the environment. Each morning my first phone check is not for the news or my emails but instead, the levels of the harmful, invisible particulate matter, PM2.5, to decide whether I can exercise outdoors, or whether the baby gets to go out on a walk in the afternoon. On many days this year, the levels have been too high for my girls to go outdoors. “The air is bad today” coming out of the mouth of a three-year-old is quietly heartbreaking. The hacking cough sounds of a baby are even worse. Eva figures out how to roll down a grassy knoll. Okinawa, March 2016. 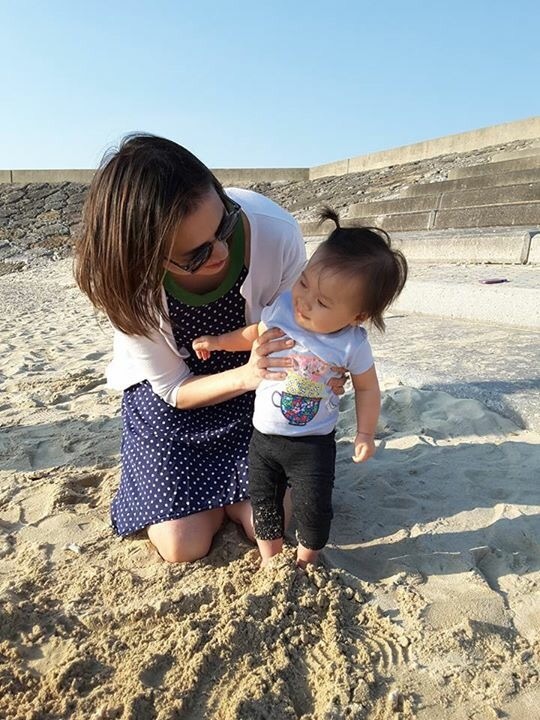 In March, my husband, daughters and parents joined me for a long weekend in Okinawa after I finished up some reporting there. The six of us were walking to dinner (we found a Red Lobster in Japan and I’ve never met a chain restaurant I didn’t love). My mom and my older daughter, Eva, disappeared for a few minutes. Later, when they caught up with us, my mom told me they had come upon a steep grassy hill and young Japanese kids were rolling down it for fun. Eva found it puzzling and delightful. She tried to do it, but it took her a few attempts before she could figure it out — the girl had never rolled down a hill before, because she hasn’t grown up around enough grass or hills to do so, nor does she get to play outside that much. I was aghast; I grew up a tomboy in the suburbs, playing in creeks in the summertime and sledding down neighborhood slopes when it snowed. On balance, I think what we gain from my posting in Seoul and traveling around the region outweighs staying close to the shoreline back home. But this urban existence in an Asian megacity has made me value small, yet huge, freedoms I never thought about before, and consider them more fully when deciding what to do next. When I was 20, I imagined I’d someday want to cover China, from China. It’s my ancestral homeland and I thought I should put my Mandarin to good use. These days, given the alarming pollution levels there, I’m not so sure. Millions of people in China and India’s megacities have it far worse than those of us in Seoul when it comes to pollution, and millions of children are growing up breathing the same air my children would breathe if I moved to, say, Shanghai, for a couple of years. But, I have a choice; many of their parents do not have the same choice. 99 percent of the time my parenting philosophy is kids are adaptable and flexible; they can easily fold into their families’ lives. But I feel like pollution and lifelong lung capacity falls in the one percent of instances where I should adapt to what they need, first. Internet hassles and lost in translation moments are the stuff of a job as a foreign correspondent, they’ll shape me, amuse me and give me a little edginess, over time. I find pollution far more pernicious. Its effects may not be known for a while, and it may never be clear how or if they do. The privileges of my life and work have so far spared me a “I can’t have it all” moment, until now. I think this is it. I want my children to be able to play outside and to cover arguably the biggest global story outside a war zone. I don’t think I get to have both. 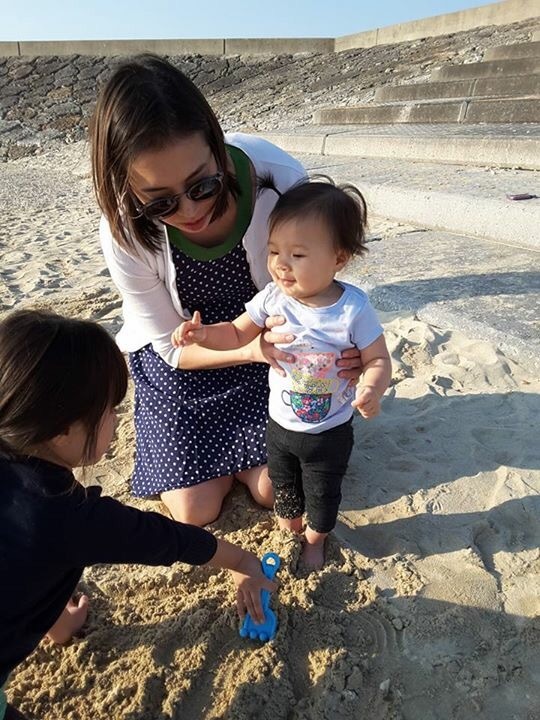 A belated post from last week’s trip to the beach in Okinawa, Japan, where Isa was a good sport about getting her feet buried by her sister. Social media makes it easy to keep relationships ambiguous and uncommitted. But keeping a digital distance from exes is also next to impossible. I’ve been out of the dating world for the past decade, which makes me unqualified to speak from personal experience but intensely curious about how technology has upended courtship conventions. Based on the recent headlines, it seems an interesting paradox has emerged: Texting and social media make romantic ties simultaneously easy to avoid and harder to shake. “Not since the dawn of the automobile has a technology — the cellphone — so swiftly and radically changed the way people interact, meet and move forward (or not) in a relationship,” writesUSA Today, in a piece that ran last week. Texting or tweeting beats talking because it keeps flirtation casual, protects you in case of rejection and, in so many cases, tends to hang a lingering ambiguity over a couple’s relationship status. These days, Snapchat, which promises “the lightness of being” by facilitating only self-destructing messages, can help you avoid a digital trail. And savvy entrepreneurs have clearly tapped into a need with an array of ex-erasing apps: MuteTweet, which keeps your ex out of your timeline. Ex-Blocker, a plug-in that makes sure no reference to certain names appears in your Web browser. KillSwitch crawls Facebook photos, videos and posts to systematically delete anything that mentions your ex. Ex-Lover Blocker activates a phone tree of your best friends when you call your ex and Facebook-shames you if you do. “There’s even something called Eternal Sunshine, which removes unwanted status updates from your Facebook feed,” writes O’Connor. “Eternal Sunshine” owes its name to the 2004 Michel Gondry film, Eternal Sunshine of the Spotless Mind, in which a man and woman are so wrecked by their split that they seek to erase their memories of one another. In the fictional universe, the mind-erasing operations did work, to heartbreaking effect. The moral of the film was that we actually need our pain as well as our pleasure to feel complete. So we could make cutting ties easier by living without a digital presence and dating the old-fashioned way — through talking — and be spared the reminders of one’s ex after the relationship goes awry. Without technology, relationships can be confusing, consuming and often hard to forget. With technology, relationships are confusing, consuming … and thanks to digital reminders, impossible to forget. This post originally appeared on NPR.org. I know, it’s sad. But the same content (up to this point) now exists at a simpler URL, www.heyelise.com, hosted by my hubby’s WebFaction server. So see you there. It’s the haunting choir rendition of Radiohead’s The Creep, the opening images of people friending each other flashing on the screen, and the carefully selected bites of drama from the film, edited together so crisply, that make the upcoming ‘Facebook movie’ trailer satisfying enough to be it’s own short film. My friends Blake, Reeve and I began a celebrity death pool last summer over some adult beverages at the Red House Lounge. At the time, 2009 was waning but some high profile people had yet to meet their maker. Blake picked Walter Cronkite, I picked Patrick Swayze, Reeve went with Robert Byrd, who cost him the contest last year but ended up winning him a point in 2010. STAKES: All you can drink on the losers during MLK holiday weekend, 2011. RULES: One point per death, and in case of a tie, we will total the distance of the death ages from 100. Greater difference (younger deaths) breaks the tie. Every member of the death pool must tweet the point update after a celebrity dies.